May I know what is the signinficance of the "10" in route-map prepend permit 10? Thanks! Perfectly what I was looking for! This is the sequence for the route map rules. You can have multiple route map entries with a single name. The lookup stops when a matching rule is found. Brilliant and striaght to the point! @Ivan, the config u have shown is to be applied on customers router or ISP router??? and i didnot completely understand about using local preference.. can u pls explain? The config would be applied on the customer router. Please who knows what prepending on internet is all about? Please i need help on this. Doesn't this only influence inbound connections (towards the customer)? The route-map out is telling the remote peer that the particular will take longer. You're right: AS path prepending influences only the inbound traffic flow (not connections). Influencing outbound traffic flow is usually very easy (use local preference or weight for pure primary/backup scenario). If we have two subnet & we want one subnet to take primary ISP & second to secondary ISP for incoming traffic. How to configure? will set as-path will affect both the subnet incoming path? why we use AS 65501 three times in "set as-path prepend 65001 65001 65001"
Ivan always have good articles. 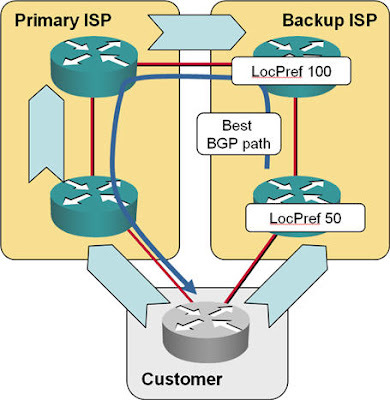 Why there is no "match local preference" for route-map used in BGP? Local preference is an intra-AS attribute, so it makes no sense to match on it on EBGP sessions (where it would never be used anyway). Use local preference, set it with an outbound route map on IBGP session. But Local preference influences the outgoing traffic and is always applied on incoming routing updats. Can we set LP in an outbound route-map? Yes you can, but since LP works only within an autonomous system, that would work only on an IBGP session. Anyhow, I wouldn't recommend it, I would strongly suggest that all routers in an autonomous system should have the same local preference for the same prefix (otherwise you might get interesting problems that would be hard to troubleshoot). How do you prevent your router from being a transit for others since you have dual ISPs and you are part of the Internet ring. * Inbound ACLs limiting destinations to your address space. What about a case when you have dual CE, one providing a 50 Mbps connection and the other being a Wireless HSPA+ just for backup? Do you know a way to actually filter the traffic in the Wireless connection so that the pipe is not saturated when switching over? Inbound ACL would drop TCP traffic, so those sessions would stall, but some UDP senders might not care. Depends on your traffic profile. Because we want to create longer as path, thus "spoiling" one link over other, so primary/better link is preferred, till it's down and BGP converges to backup/worse link. will be chosen from customer site. please explain i see traffic drop.